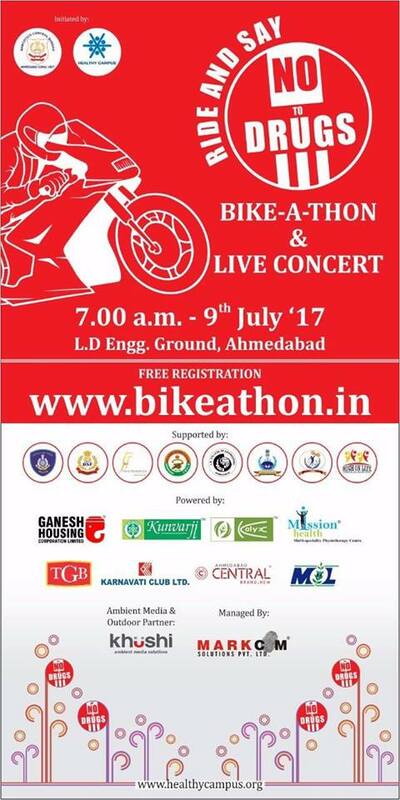 Narcotics Control Bureau & Healthy Campus announces Bike-A-Thon. It’s an effort to create awareness about the injurious & destructive effects of drugs and to educate young breed of our Nation to stay away from drugs. The bikers of Ahmedabad will go to various parts of the city and give away ‘THANK YOU CARD’ to the people for staying away from the drugs and request them to take pledge. Drug abuse is one of the biggest social evils to affect societies the world over today. And the sad part is that even though millions are suffering due to their addictions every day new people get caught up in drugs. A lot of this is due to a communication gap. One does not get to know of the harmful effects of drugs in everyday life in detail. Bike-A-Thon will be joined by more than 1000 bikers. There are no registration charges. Participant will get a ‘Say No to Drugs T-shirt’, refreshment & certificate of participation. Participant will relish with live concert post completion of the rally and a larger than a life opportunity for participants to meet Akshay Kumar by participating in ‘Slogan Competition’.